Hope you are getting thru this winter ok its been busy here. Above is a new painting called Creating Spring. Just a simple nature fae sitting on a dewy leafy projecting into a dew drop her vision of spring. I hope you enjoy this painting as I did creating it. Next in the news is a new figurine that is from a painting done in the past called Tea Bath Faery. 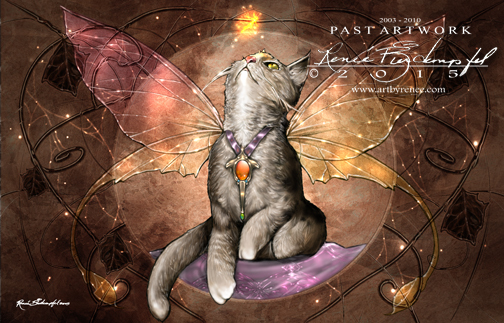 I created her back in the day when I first started creating faery art. Its a funny piece I hope you now enjoy it as a figurine. Thank-You Pacific Trading Co for this lovely rendition of Tea Bath Faery you created and to Tate and Co for helping make her manifest in 3-D. 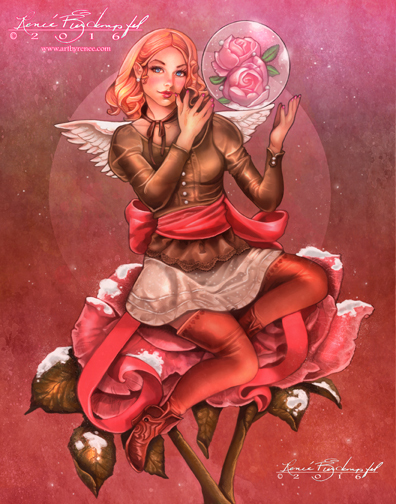 Above is my new art called "Snow Roses" I hope you enjoy this painting she's just a little Christmas Cupid adding some glittery snow about. I want to wish you all a joyus holiday season however you spend it. May your new year be filled with abundance and my hope is for a more peaceful existence with one another here on this earth. Long time no updates...But I have been working on new things and personal projects behind the scenes. Also I have had a three month battle with some sort of major fatigue issue which I have given up coffee and now I am a green tea gal. Along with changing my diet and getting a treadmill and taking herbal supplements. There has been a bit of a improvement so this is a good thing. 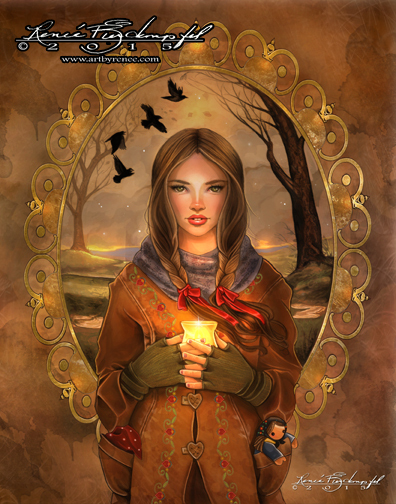 The painting above is called "The Foundling" its a nice wintry piece to kick off the cold weather season. Its a image of a angel caring for a lost baby deer. I like to think animals have guardians too this one is helping a fawn crossover water. I hope your autumn has been colorful and grand! New Art! " 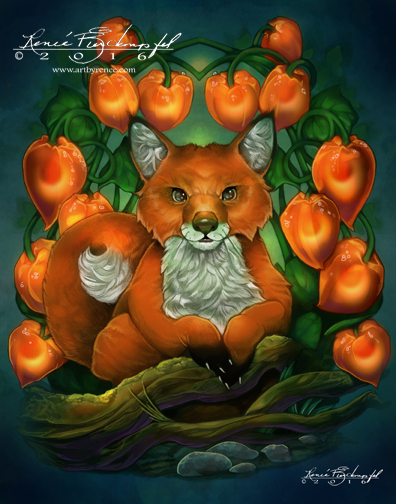 Night Light"
I just finished this painting a few days ago with a imagined scene of a tired little fox at night who wanders into a dewy garden. He is just looking for a place to rest his little bones when he sees a glow. There in the garden is some magically lit Chinese lantern plants. Feeling comforted he settles there among the glowing lanterns for the night. Thank goodness for garden faeries who like to light these little lanterns for the small animals that stray into the garden. I want to wish you all here in the states a Happy 4th of July! This year its really important to remember our independence it may mean different things to all of you in different ways. Freedom is so important and precious lets celebrate it. "Hear Ye! 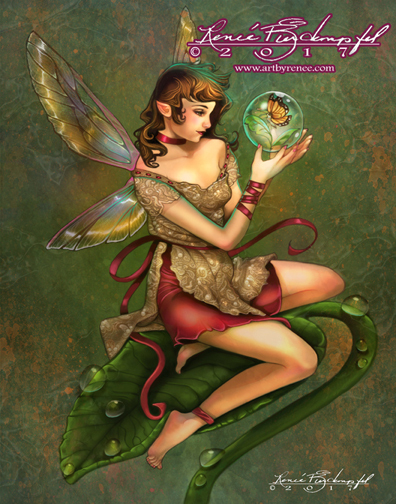 Hear Ye!...New Art and New Product News"
Flying through the land of fae and outside of the mushroom ring is the "The Faery Express". 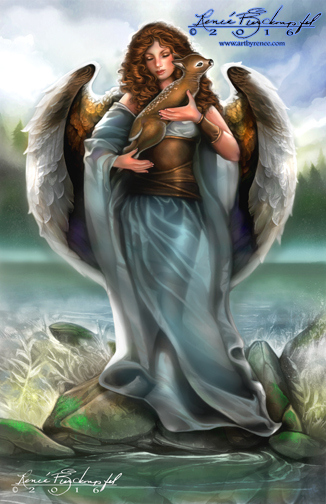 Carrying with her is good news, mail and gifts while flying on her messenger bird she shares news across the land. 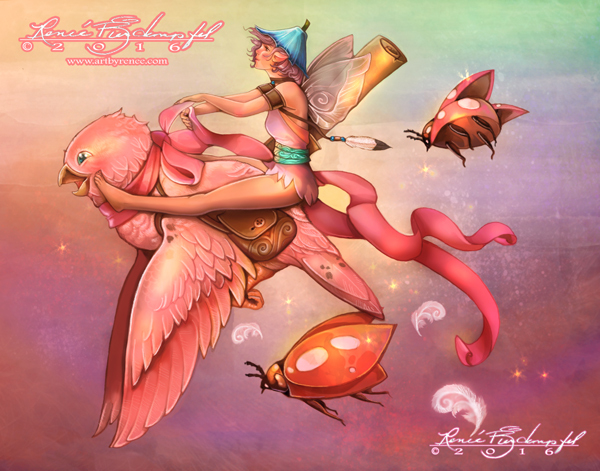 There is lots of news this month...First is the new art I have posted above called "The Faery Express" the colors are warm and pastel to celebrate the first of spring. Swiftly moving with them are two ladybug companions assisting along in the journey. The bird is rather fantastical in color as well as the ladybugs which was fun to paint. This art has made its home in the New Art section of this site. A big Thank-You to Tate and Co and Wise Unicorn for working together to create this beautiful rendition of "Star Weaver". 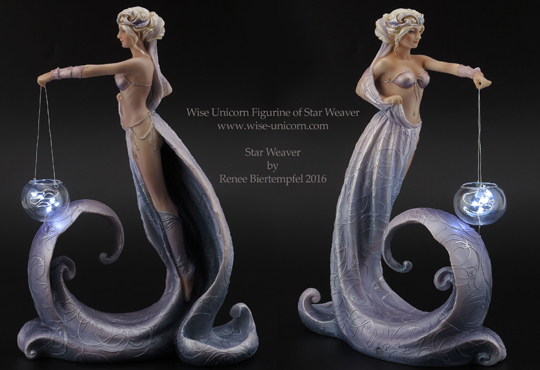 Wise Unicorn has beautiful figurines in many themes...I am amazed at the quality of the piece it really captures the painting of "Star Weaver" which was painted years ago "see below"... Also her lamp lights up too! To buy this figurine its available at the Fairy Glen site here. I have more news and will be posting a update shortly as I gather the info together to share. Aside from everything I want to wish you a Happy Easter! Don't forget the good news the reason for the season its the greatest news of all. Maybe that's the good news of The Faery Express...If you don't celebrate then a most wonderful first day of spring! And at least get in one wee piece of chocolate or a jellybean or just nom on a hearty salad. One last pic taken a few weeks ago from my backyard which I call "The Promise of Spring". 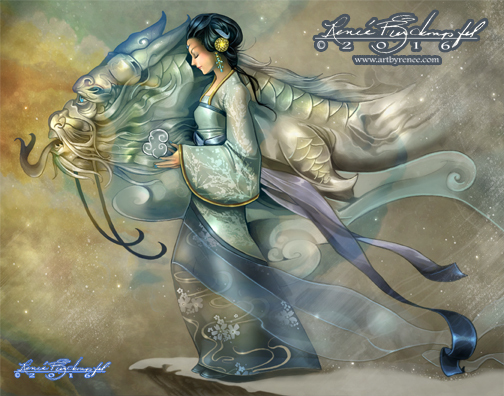 Was a busy start to the new year but I did complete the asian themed painting called "Wind and Snow Dragon". 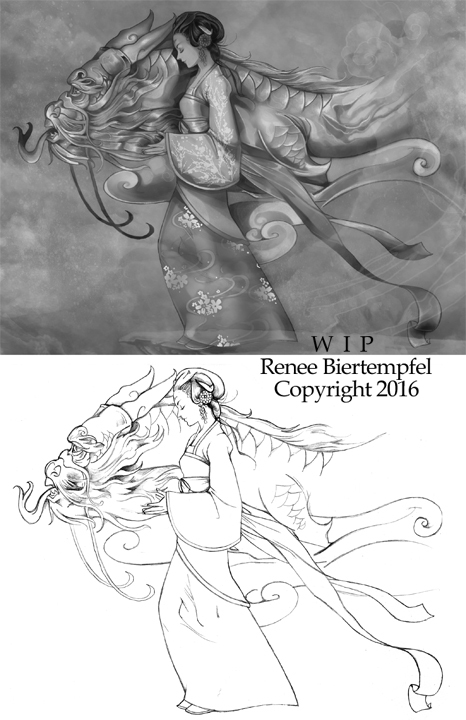 I hope you enjoy the WIP so you can see the process on how this piece was completed from sketch to final painting. Happy 2016! 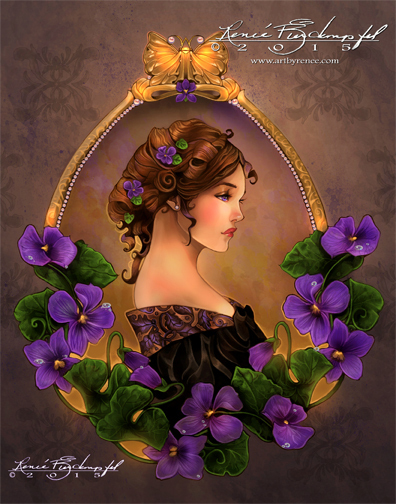 I have two new pieces of art "Majesty" and "Violette". 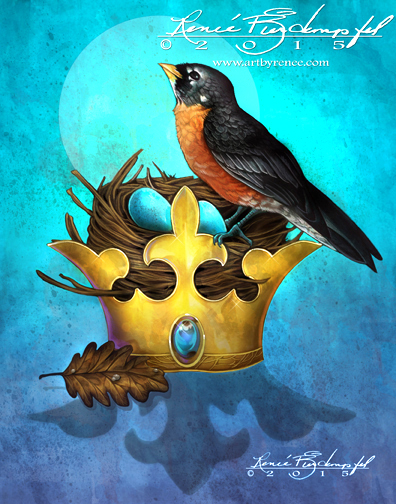 Majesty is about the grandness of nature an "expression of the divine" which is what the crown represents. Violette is for my mom... mentioned in the previous post. Next piece I have in the works is a fantasy piece with an asian theme which I will post a wip soon. I have anthor painting started but its still speaking to me but an idea is evolving there and that will be shared as well. 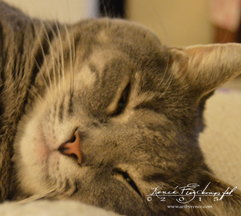 Have a wonderful January and stay warm! into January. The first one is called "Majesty" the other is called "Violette". The Violette one is an image my mother wanted a cameo piece with a violet theme "my mother loves violets". 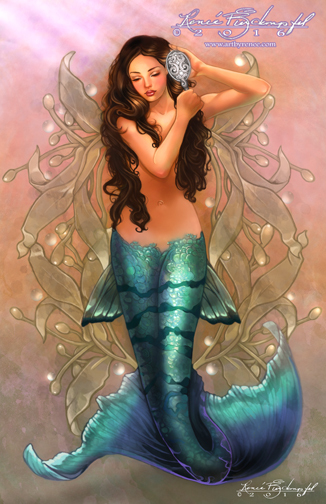 Majesty is about the grandness of nature which you will see when I share the full image. Well I hope you all have a wonderful holiday and a most blessed and abundant new year. Gobby sends you all a Seasons Greeting! posted today to share with you all. Well the cold weather has officially started so that has inspired me to paint some winter themed paintings. 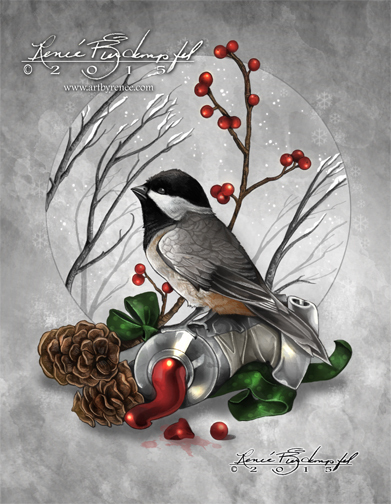 The first one "Colors Of Winter" is one of my favorite birds the black capped chickadee which we have an abundance of these cute little guys here in Pa. The second image above is a work in progress called "Autumn Ends" which is a childhood inspired piece. It's the time of the year where the clouds have that heavy grey tone alongside golden light trying to pierce through them. In the image its like the girl captured some of that golden light and its illuminating her way through the dark and cold. 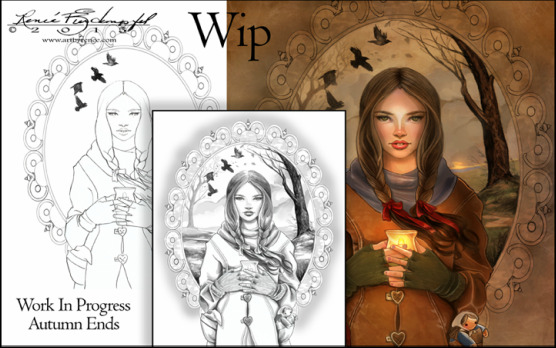 Both pieces are traditionally rendered then scanned and painted in photoshop. I hope you all have a great Thanksgiving month! 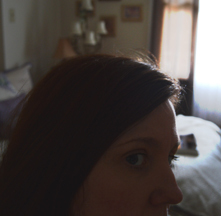 I wanted to focus this first blog entry mostly on thank-yous more than on myself but I will write this much. As you know I am not the greatest writer and also I am a very shy person but I will give this my most earnest attempt to write and share. Whatever I post here you are getting my perspectives and in no way does that mean I expect others to believe in what I do or even to ever agree. What I share is where I am at today from personal experience presently. Mostly I intend to share current works of art but from time to time you may get some personal posts. I'm thankful everyday we still live in a world where we can express ourselves and its my hope we don't ever lose that. Gobby yes he is still here.. he is my kid and my dearest friend. He is all grown up and huge! Everyone who meets him always comments how big he is but they also love how friendly he is as well. He will run up to guests and take his paw and rub the top of his head and ears indicating pet me! He keeps me motivated and going everyday he loves to tell me stuff I just wish I knew what he is saying all the time... funny sometimes I do. 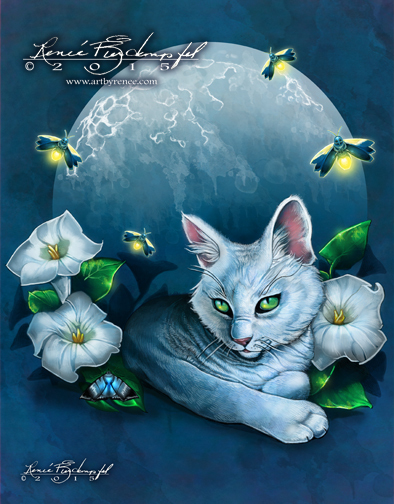 He is the kitten you see in the past painting "Goblin's Faery Guide" and "Luna". To My Family I am most honored you are my family thank-you for wonderful holidays and visits! cause they have been downright magical. Dawn and Andy thanks for over the summer being encouraging about my work. Also to the children Aden, Josie, Kyla and Ella you are inspiration in itself and Josie I hope you become a great book illustrator "She has been drawing lots and has expressed to Biers and Kristen wanting to write and illustrate books". Mom Thank- You for being my Mom! Last but certainly not least...Thank-You Lord Thank-You for your inspiration, your guidance Thank-You for restoring my life. Thank-You for your small voice in my heart that spoke in volumes. Thank-You for the gift you have given me.